​Lake Sugema is a 579-acre lake is stocked with large mouth bass, bluegill, black crappie, channel catfish, and saugeye. 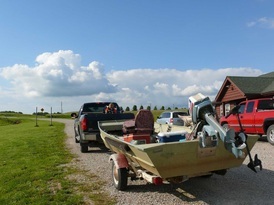 A lake built for fishing by DNR, it is one of the most popular SE Iowa lakes for fishing. Pine Ridge Cabins are within 2 tenths of a mile from the north side of the lake. We also have a private 2.5 acre pond to relax and fish out of.